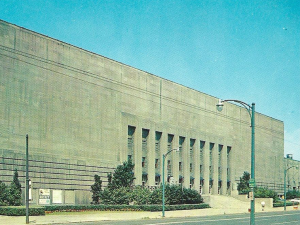 The Memorial Auditorium was home to events of local, national, and international importance. For Buffalonians it’s where the Bisons brought home five national championships on the ice and the Braves took to the court. On the national level, it was a stop for Dwight D. Eisenhower and John F. Kennedy as they campaigned to be the next president of the United States. The Memorial Auditorium was the birthplace of the Polish American Congress, a national organization that would fight for Poland in the political arena. On May 28, pre-convention Masses were held at St. Stanislaus Roman Catholic Church and the Holy Mother of the Rosary Polish National Catholic Church with a noontime parade down Broadway to the Auditorium. At 3 o’clock sharp Charles Rozmarek, president of the Polish National Alliance, formally convened the congress. Over the next 70 years, the Polish American Congress would continue to fight for a free Poland, spur a U.S. Congressional invitation into the Katyn Massacre and help Poland secure a seat at NATO. Today, the congress has been applying pressure to the Federal Government to approve Poland for the Visa Waiver program. "Closer U. S.-Polish Relations Urged." Buffalo Courier-Express [Buffalo, New York] 29 May 1944: 6. Print. "More Than 20,000 Expected To Join in Polish Congress." The Evening News [North Tonawanda, New York] 19 May 1944: 3. Print. Pienkos, Donald E. "Polish American Congress: A Brief History." Celebrating the Polish American Congress 70th Anniversary. Buffalo, New York: n.p., 2014. 4-7. Print. "Poland's Rebirth Viewed As 'American Question'" Buffalo Courier-Express [Buffalo, New York] 30 May 1944: 10. Print. "Poles to Seek Unity Here On Postwar Plans." Buffalo Courier-Express [Buffalo, New York] 28 May 1944, sec. 5: 1. Print. "Polish-American Congress to Meet." Buffalo Courier-Express [Buffalo, New York] 21 Apr. 1944: 6. Print. "Polish Congress Asks FDR To Help Guard Motherland." Buffalo Courier-Express [Buffalo, New York] 31 May 1944: 20. Print. "Polish Congress Concludes Sessions." The Evening Leader [Corning, New York] 31 May 1944: 1. Print. "To Review Polish Congress Session." The Niagara Falls Gazette [Niagara Falls, New York] 1 June 1944: 15. Print. "U. S. Is Asked To Help Poles Retain Status." Buffalo Courier-Express [Buffalo, New York] 29 May 1944: n. pag. Print.